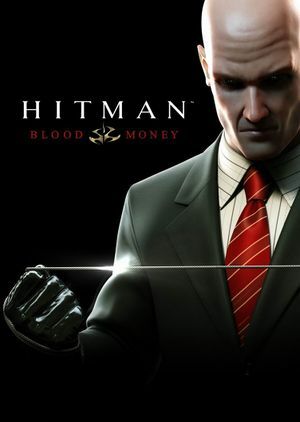 The version included in the retail 'Hitman Collection' (Eidos, 2009) is entirely DRM-free. The European release of the Hitman Collection is DRM-free and already patched to the latest version. Latest version is 1.2. Right patch for all game editions can be found here. Maximum supported horizontal resolution is 1920. See Widescreen resolution. Set in the configuration tool. Not available in windowed mode. 60+ FPS affects the physics; cap the frame rate at 60 FPS. Extract h4.zip to <path-to-game> (password=h4). 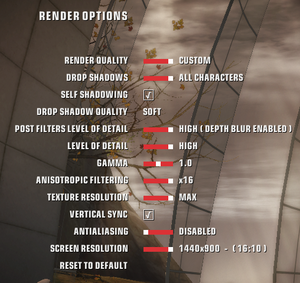 Edit h4.ini to set the resolution and FOV multiplier. Works with Steam version. Supported exe size: 4 366 336 bytes; 1 412 608 bytes. Remapping can be very buggy and may require multiple attempts to make it stick. Not available in digital releases. There is a common issue, that seems to be introduced with Nvidia's driver v 353.62. 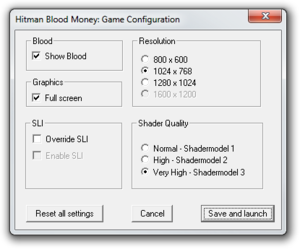 Launch the game's configuration tool. If everything else fails, you can play through individual levels using a profile that has all missions unlocked. Right click on the shortcut on your desktop. Click properties then click on the Compatibility tab. Check the box "Run this program in Compatibility mode for:" and select Windows 2000. If you have 2 monitors connected, disable one and try again. Doing so will disable Depth of Field and the "Color Grading" effect which contributes significantly to the mood of many environments. For the Curtains Down mission on Windows XP, turn sound hardware acceleration down (basic acceleration) or off (no acceleration). Down works for some; others need it off entirely. Go to Start > Run > Type dxdiag. Click on the 'Sound' tab, and take the hardware sound acceleration down to the bottom. Not possible on Windows Vista. 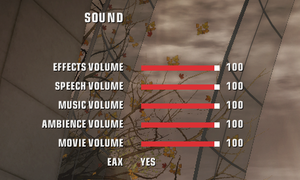 The only method that seems to work is disabling your sound temporarily for that mission. This error is often due to a faulty or damaged DVD. The damage may or may not be visible to the naked eye. Right click 'My Computer' > Click 'Manage'. Expand 'Disk Drives' in the device manager tree. Right click your DVD drive > Click 'Uninstall' (Take any disk out first). Reboot your computer and let Windows 'Find new hardware' and reinstall the DVD drive. When doing this, follow instructions very carefully. Failing to do so may leave you with a non-working drive. ↑ 2.0 2.1 File/folder structure within this directory reflects the path(s) listed for Windows and/or Steam game data (use Wine regedit to access Windows registry paths). Games with Steam Cloud support may store data in ~/.steam/steam/userdata/<user-id>/6860/ in addition to or instead of this directory. The app ID (6860) may differ in some cases. Treat backslashes as forward slashes. See the glossary page for details. This page was last edited on 17 April 2019, at 16:10.